This season saw a unique set-up to the annual PBA All-Star festivities, what with the league opting for a week-long series of events highlighted by not one, not two, but three All-Star Games featuring different iterations of Gilas Pilipinas against All-Stars hailing from the country's three main island groups: Luzon, Visayas, and Mindanao. When I first heard of this idea, I thought it was brilliant for two main reasons. One, it would be a great way for the league to emphasize their support for the national team, and, two, it would bring the PBA stars to not just one, but a total of three provinces. It's a small step, but I hope this move by the league indicates a progressively stronger stake in the national team and a gradual change in their approach to more constantly bringing the games to the fans outside of Mega Manila. Kicking off this year's festivities, the national team settled for a 114-114 draw against the Mindanao Selection Wednesday at the Xavier University Gym in Cagayan De Oro City. Star's Mark Barroca hit a booming triple with 49 seconds to go to tie things up for Mindanao. Both teams failed to connect from that point on as an All-Star game involving Gilas Pilipinas ended in a draw for the second time in the last four years. TNT's Troy Rosario led Mindanao with a game-high 28 points off the bench, and he shared MVP honors with Phoenix rookie Matthew Wright of Gilas. PJ Simon added 14 points, while Barroca was good for 13. Matthew Wright (PHI) - 22pts, 3rebs, 4asts, 4stls, 4 triples. Troy Rosario (MIN) - 28pts, 4rebs, 1ast, 1blk. 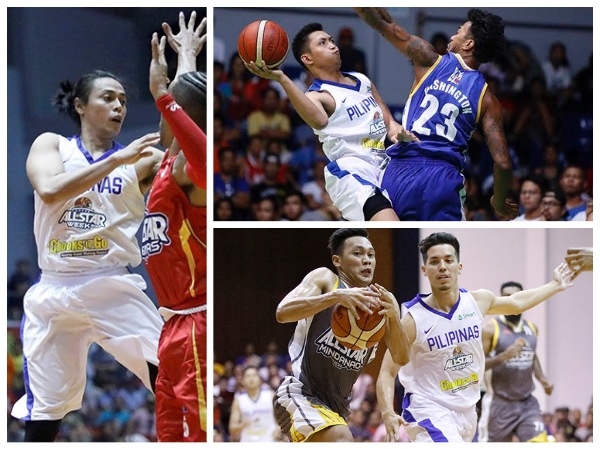 Showing incredible heart, Gilas Pilipinas went on a 17-0 closing run, beating the Luzon All-Stars, 122-111, Friday at the Quezon Convention Center. Jonathan Grey came off the bench to lead Gilas in scoring with 19 points, while MVP Matthew Wright added 15 points and seven assists. Mike Tolomia (15 points), Cruz (13 points), Rosario (12 points), and Almazan (10 points) all finished in double-figures. Leading by 17 points in the third period, Luzon absolutely collapse in the final 12 minutes, losing the fourth quarter by 20 points, 17-37. LA Revilla (PHI) - 9pts, 11rebs, 6asts, 1 triple. Japeth Aguilar (LUZ) - 18pts, 10rebs, 1ast, 2blks. Calvin Abueva scored 26 points and Terrence Romeo added 25 to lead Gilas Pilipinas to a 125-112 win over Team Visayas in the third and final leg of the PBA all-star series at Hoops Dome. Fielding its entire lineup that will play for the Southeast Asian Basketball Championship minus Andray Blatche, Gilas rallied behind Romeo in the second quarter to come back from 15 points down and used some stingy defense in the fourth to upend the All-Stars. Calvin Abueva (PHI) - 26pts, 7rebs, 1ast, 2stls, 2 triples. Chris Ross (VIS) - 13pts, 7rebs, 5asts, 3stls, 1blk.